Chewy, moist brownies? Yes. 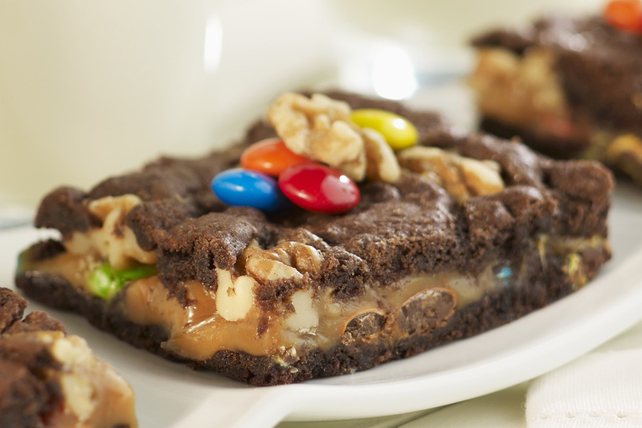 Chewy moist brownies with caramel, nuts and candy-coated chocolate pieces? Heck yes. Line 13x9-inch pan with foil, with ends of foil extending over sides. Spray with cooking spray. Microwave unsweetened chocolate and butter in large microwaveable bowl on HIGH 2 min. or until butter is melted; stir until chocolate is completely melted and mixture is well blended. Stir in sugar. Add eggs; mix well. Blend in flour. Pour half the batter into prepared pan. Bake 25 min. Meanwhile, microwave caramels and whipping cream in microwaveable bowl 2 min. or until caramels are completely melted and mixture is well blended when stirred. Pour caramel sauce over brownie. Sprinkle with half each of the nuts and candy-coated chocolate pieces; top with spoonfuls of remaining brownie batter. Sprinkle with remaining nuts and candy-coated chocolate pieces. Bake 25 min. or just until top is firm to the touch. (Do not overbake.) Cool completely. Use foil handles to lift brownie from pan before cutting to serve. Enjoy one of these nutty brownies as a special treat.